I generally think of myself as a rational person. In one of my stories I wrote about how the character was so tired he was seeing things darting in and out of his vision. This happened to me while finalizing a 40 page paper in college that was due at 9am. It was currently 5am. As I typed furiously on my laptop, I would see small fuzzy black shapes appear to run across the doorway in front of me, back and forth. I know that was my brain reacting to being up as long as I had been by then, in addition to how much effort I was putting in to my rushed paper. I have a hard time taking purported recordings of ghostly voices as authentic for that reason. They are still creepy as all hell to listen to, but I kind if file it under entertainment instead of something real, like watching a scary movie. Same thing why I can accept that ‘spirit orbs’ in photographs are really just specks of dust, insects, simple trick of the lighting, or even just a defect in the camera. When you’re waking up and start seeing things or can’t move, it’s generally sleep paralysis. Your body hasn’t caught up to your waking brain yet. This can cause feelings of dread in addition to the sensation of a crushing weight on your chest, only because your breath is still timed to your sleep cycle instead of your more active and awake mind. Now, I’m not saying that I don’t think that the supernatural doesn’t exist, or that all ghostly experiences have a totally reasonable explanation. That would make me a bit of a hypocrite considering that I’ve declared my old house haunted. It’s that I know the human brain and senses aren’t totally reliable. As such, feel free to pick and choose what feels credible, however these are all things that I have been a part of while I lived at that house. The house, prior to renovation. The window in the middle of the top five was walled over. The two on the right of it is part of my room. What does intrigue me though are when strange events happen multiple times and to different people. It’s your choice to believe if my old house was haunted or not, but the abrupt change of moving to a new house completely altering my sense of isolation and fear is kind of something I take notice of. The footsteps I mentioned were very common at night. I had a loft bed, meaning my face was about three feet from the ceiling. As I climbed up and into bed, switching off my light, it wasn’t guaranteed that I’d hear them. Some nights though, when reading by flashlight for instance, they would start. I would listen as heavy footsteps worked their way across the attic, sometimes in a bee line towards where the stairs were, others just wandering around the area. I would sit up as best I could in the bed, clutching my flashlight, ready to run and get my dad if I heard the steps getting too close to the stairs. Looking back, if it was a ghost, I’m not really sure what he’d be able to do outside of throwing socks and foul language at it, but it made sense at the time. Sounds were a big part of the experience while living there that I haven’t heard much of again. One summer day I was upstairs in my room playing with Lego. I was trying to build the perfect undersea base that wouldn’t flood anytime I put it underwater. It didn’t work, and now I know why I never tried to be an engineer. Anyways, it was the middle of the day and my mom had left for the store. I was old enough to watch myself and my sister for short stretches like if my mom had to run a few errands. It was about 40 minutes later when my mom called my name from downstairs. “I’m busy Mom! Give me a couple of minutes.” Injection molded plastic lives were on the line here. I didn’t have time to help unload groceries at a time like this! My dog, Indy (”We named the dog Indiana!”), just sat there looking through the doorway towards the stairs. 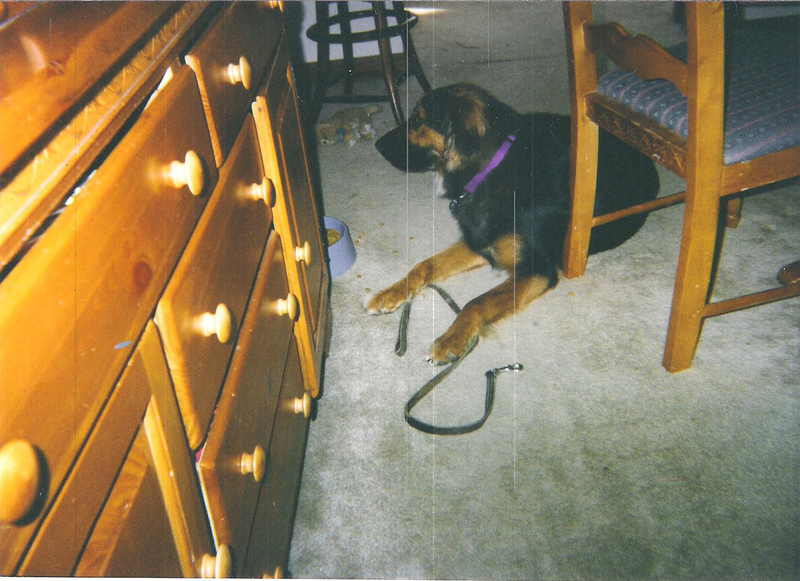 He was some kind of German Shepherd mix, but had a long and fluffy coat instead of the coarse hair of a full blooded German Shepherd. Because of that and his in-your-face loving nature, he’d have a tendency to destroy my Lego projects if something got him excited. This time however, he didn’t move. Baby Indy, destroyer of plastic brick worlds. “Chris! Come downstairs!” There was impatience now creeping into her voice. But I was a brat I was too deeply engrossed in my project. Still, I yelled back again that I would be down shortly. Indy just sat there, stock still. Now, a bit of information on Indy’s background. When people say “I had the best dog growing up ever!” I actually did. He was smart, kind, and loved people. Anytime someone would come home he’d rush downstairs to meet them. Especially if it was my mom, since she fed him and let him outside most often he’d be especially happy to see her. Then he would proceed to whine at her for everything under the sun because even though he was awesome that doesn’t mean he wasn’t a drama queen. He won ‘Best Dog’ at our town fair 3 years in a row. That is not relevant to the story in any way, but I had to throw that in there because I practically lived with a celebrity. “Chris!” My mom was flat out yelling now. I was just mad at this point and I threw down what was in actuality going to be a land-based lab, as the poor soldiers and scientists would soon learn that the underwater structural integrity was not sufficient. The groceries could wait, I was in the middle of a project. I stood up to stomp downstairs, Indy followed me with his head and tail low. I turned the corner at the base of the stairs and my mom was nowhere to be seen. I opened up the front door, but the driveway was empty. No one was home but me. I’ve had several experiences of seemingly being called by something that wasn’t there that could be chalked up to my mind trying to force order on to a random bit of noise. Now I realized that something was wrong. Indy was following me around, anxious. He hadn’t tried to rush out of my room to try and greet my mom and escape into the front yard. He had clearly heard something while we were in my room, and it had unsettled him. In my case if I had heard my mom call my name once and she wasn’t there, I’d get a bit creeped out but inevitably chalk it up to hearing things. But three times, in different tone and words, and my dog had clearly heard it too. Chills went up my spine as we went out in to the backyard to wait for someone else to get home. 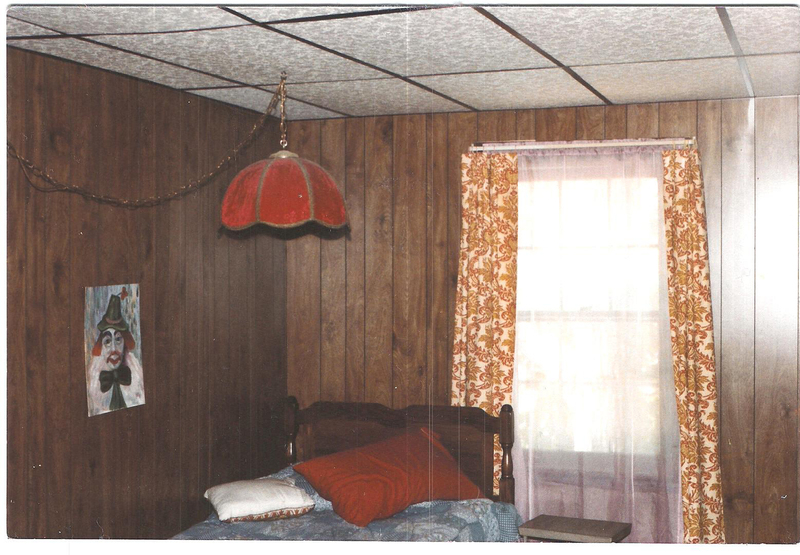 This was my room before renovation. My guess is that the picture marks where the dead clown’s body was walled up. 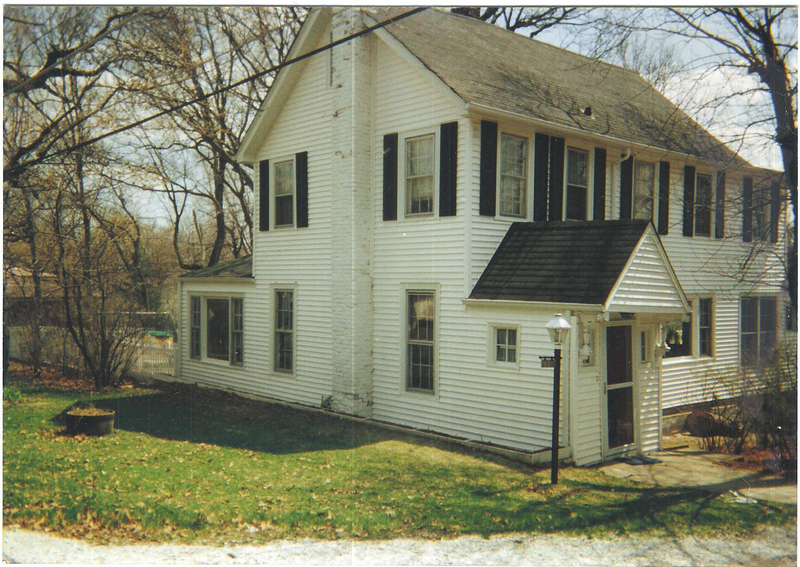 I don’t know if my family members had the same type of experiences that I did, however a few years ago over some beers, my dad and I were discussing the old house. Now, it was an unspoken truth to all of us that there was something up with that house. We began swapping stories, some of which have been long forgotten, when I asked him what creeped him out the most. “The shadow people,” he stated. I felt the hair on my neck stand up. I knew exactly what he meant. My father and I would generally read at night. Since his side of the bed looked out into the hallway, and ultimately into my room, we could see each other while reading. At night, the hallway light would be off, but each of our bedroom lights would be on, slightly illuminating the hallway. “Sometimes at night, I’d see something moving. I’d put down my book and it was a shadowy black mass the size of a person. It would move from the stairs and into the bathroom, or between the different bedrooms,” he continued. I had seen similar things. One night, after finishing my book I switched my lamp off. I wasn’t tired, and as my eyed adjusted to the dark I could see it. Next to my bed was my desk, it was kind of a modern style with cut outs on the side so you could see completely underneath it from all sides. I’ve tried to explain this experience as the product of a tired mind. I’ve seen things like that before seemingly cross my room when I wake up groggily in the middle of the night. “And Chris,” you don’t actually say but it helps the narrative style of this essay flow a bit better, “you were also reading and probably falling asleep.” When I was younger I had the lamest superpower. Anytime I read at night, I was so engrossed that I wouldn’t get tired. I’ve accidentally stayed up until dawn without realizing what time it was, just because I kept saying “One more chapter.” Now when I read in bed I have about a 20 minute window before my brain shuts down and I find my laptop stuck between pillows or my glasses still on my face when I wake up. Back then, my mind was as awake as if I had just woken up and run a 5k. I’m bad at 5k’s but my mind was alert so the analogy stands. A few moments after my eyes adjusted I first saw it. There was someone crouched under my desk. Their features were vague, but I knew they were looking at me. It was shadowy and had only partially distinct features: head, arms, that kind of thing. My mind was divided on the sudden intrusion. One part of me was screaming on the inside that it was some kind of ghost or other strange being, the other part of my mind was chiding its other half for not realizing it was just a weird shadow, probably something being distorted by the light coming in from my windows. I started to calm myself. It was static, just a mass sitting there under my desk. It was just some kind of weird effect, like in Scooby Doo how the bad guy would use a projector, fog machine, and some pipe cleaners glued to old toilet paper rolls and it would look exactly like a realistic ghost ship crewed by the damned, torn sails and all. Maybe Scooby Doo isn’t the best example, but you get the idea. Then it moved. It leaned back, and started slowly reaching one arm around the back of the desk towards my nightstand. Towards the only light source within my reach. I stayed stock still as I watched it slowly reach out towards me. It felt like the thing knew I could see it, and was toying with me. Drawing whatever this was out for as long as possible. Sweating and shaking, I felt my hands tingling. The switch for the lamp was on the cord, on the opposite side of the nightstand from me. The animal portion of my brain kicked in, and my arm shot out. I grabbed the light and flipped the switch, illuminating the room with the weak lamp bulb. Whatever it was, it had disappeared. For the first time since I was a wee kid, I purposely kept the lights on while I slept. “Why didn’t you ever tell me of that stuff? I saw it too,” I replied. My final post on the subject will be coming up next. This next one is long running and needs a bit of back story, so I need to give it its own post. Thanks as always for reading! Anything similar happen to you? Throw it down in the comments!